Louie Leguia grew up in Los Angeles, California, and trained at the Ecole Normale in Paris, and the Juilliard School. His teachers included Arthur van den Bogaerde, Kurt Reher, Andre Navarra, Leonard Rose, and Pablo Casals. Luis or Louie as he is known to his friends, had a very challenging childhood but managed to overcome many obstacles to become a successful cellist. Louie’s father was a consul general of Peru. When the political regime ended in his country, he lost his position in the diplomatic corps. He was unable to find work during the Depression, and returned to his country, when Louie was 3. This left Louie’s mother, Margaret, or Meme as she was known, to fend for herself and Louie. He had no contact with or support from his father for the next 14 years. His mother worked as a secretary to support her son and most of his childhood was spent moving from boarding house to boarding house. Starting the cello late in life, at nearly 15 years old, Louie had advanced enough by the time he was 17 to go to Prades France and audition for Pablo Casals, who made him his only scholarship student. At 19 he was offered principal cello with the Longine Symphonette and Leopold Stokowski asked him to be assistant principal cello and soloist with the Houston Symphony. Instead, he went to study at Juilliard. He joined the Boston Symphony in 1963. Louie has played concertos and solo recitals on several continents, making tours through Europe, South Africa, Lebanon, Ethiopia and Syria. He has made 15 solo tours of South America, including one in which he performed all the Beethoven sonatas and variations, and has performed widely in Canada and in the United States. 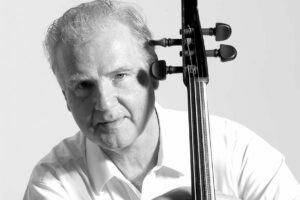 He has given master classes all over the world and was the Chair of the Boston Conservatory Cello Department for nearly a decade. He has given numerous first performances, including the Boston premiere of Schoenberg’s Cello Concerto and the world premiere performances of works by Robert Parris, Pamela J. Marshall and Vincent Frohne. He played the world premiere of the Piston “Duo” for cello and piano, which was dedicated to him, at the Library of Congress in the 70’s. Robert Evett composed his cello concerto for Mr. Leguía, who gave the world premiere of that composition at the National Gallery of Art in Washington, D.C. on the occasion of its 30th anniversary. Other composers who have written works expressly for Louie include Edgar Valcarcel, Josep Soler. In the early 1970s Louie played a recital in Pretoria, the capital of South Africa. It was sponsored by the U.S. State Department and was the first concert ever to be given to a biracial audience. While on sabbatical from the Boston Symphony Orchestra, during the winter of 1984-85, the tri-centennial of Bach, Louie performed the complete cello suites of J.S.Bach in Madrid, Spain and made recital and concerto appearances in Portugal, Berlin, Tubingen and Belgium. He also did extensive research on Spanish music for the cello. It was soon after, that he started his other journey, to find a more beautiful and penetrating cello for his performances. Though music had consumed most of his life, Louie became an avid sailor in the 1970s. When he was out on his catamaran he could feel the hulls humming and it started him thinking about the resonance. 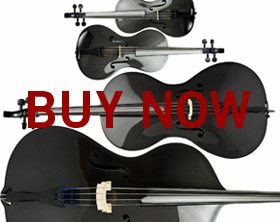 He realized how the old boats were made, and seeing the new fiberglass ones and the ultra-sophisticated boats in carbon fiber, made him think those materials might make a great medium for a cello. He thought he could do away with all the things in a traditional cello that a wooden instrument needs for structural stability. He could make it lighter and responsive, and very strong. He wanted the tone of a Stradivarius or Montagnana cello and he wanted it to carry out over an orchestra when playing a concerto. And he wanted it with a beautiful quality. The cello’s development evolved over the course of eleven years. Louie made his first prototype in 1990 from scratch out of fiberglass. It was a typical cello with cornices and a scroll. It looked like and was built like a normal cello. Then he put aside all his notions of a cello having to look like a traditional cello. His second attempt was a different model with no cornices. Louie realized that his goal was to create an instrument that would sound as good as any world class cello, not to make a cello for its looks. He felt the first one didn’t sound all that great, but others were stunned when they heard it. It sounded like a ….cello (surprise) and a pretty good cello at that. The second version was an improvement, but still not what Louie was looking for. But the third one had a wonderful quality. The final prototype was developed with a one-piece back side and neck; the top as the second piece; and the fingerboard as a third piece. It’s simple. It’s beautiful! And it works well. It was only at this late stage of development that it occurred to Louie and his wife, Stephanie, that these were sellable and could put really good instruments into the hands of players who would never be able to afford a wooden instrument with the sound that his carbon cello had. However, they realized that he could not keep building them himself. Once he was ready to begin production, it was his connection to sailing that led Louie to Steve Clark, a master in the production and fabrication of carbon fiber products and chairman of Vanguard Sailboats, an industry leader in supplying boats, accessories and services to the small sailboat market. Clark, who also designed and built the “C” class catamaran, Cogito, which holds the Little America’s Cup title, guided Louie through the final stages of developing what is now known as the Luis & Clark Cello. Steve is not a partner in Luis and Clark, but allows us to pay homage to him by using his last name when we named the company. It was a small token for the great appreciation we have for him. In the final result, you can see that it’s not a wood cello but the quality is beautiful, the power and reverberation is just superb, and the depth of it Louie finds wonderful. From his standpoint as a working musician, he was keenly aware of the advantages to his new instrument. For instance, when you put your bow out on the point on the A string, your bow arm is closer into your body, thus reducing the sore shoulder syndrome that any professional cellist gets after many years and many hours per day of performing. This is very helpful with that, as well as rotator cuff and tendonitis. Many Luis and Clark owners rave that they can now play pieces again that they had given up on due to physical problems. Louie retired from the Boston Symphony in 2007, but continues to play as a soloist. He plays a robust game of tennis and tries to swim every day. But his days are also focused on checking each instrument that leaves the shop. 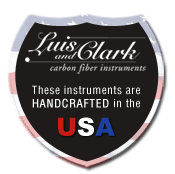 Luis and Clark now has owners of his instruments in over 55 different countries, from Norway to South Africa and from Panama to Malaysia. There is even one in the Congo. Louie sometimes laments that he will only be remembered as the inventor of the carbon fiber stringed instrument and not a cellist, but it’s been a remarkable journey for someone with very humble beginnings.